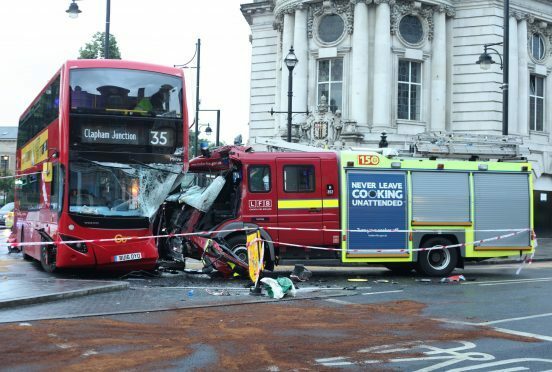 Three people have been taken to hospital after a packed bus was involved in a collision with a fire engine and a car. The vehicles crashed at the junction of Acre Lane and Brixton Road close to Lambeth Town Hall, south London, at about 6.15pm. One male firefighter and the male bus driver were taken to hospital following the crash, along with a 48-year-old female bus passenger complaining of back pain. Their injuries are not thought to be serious, a spokeswoman for the London Fire Brigade said. She added that nobody had been trapped in the crash and the three vehicles involved have all been deemed safe to be moved. Four more people were treated for minor injuries at the scene. The junction and several roads around the crash scene remain closed. A spokesman for the Met Police said it did not appear to be a major incident.